Copy Blu-ray discs one at a time. Copy Blu-ray Discs one at a time. Copies BD-R, BD-R DL,_BD-RE, CD-R/RW, DVD-R/RW, DVD-R DL and DVD+R/RW all on the same system. Features 8-button panel and comes with the option for networkability, and offers CopyLock copy protection software. 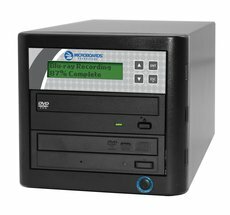 Does not include hard drive.The CopyWriter Pro is also available as a LightScribe or CD/DVD-only duplicator.